This game’s main selling feature was actually the result of a desire to add length to the game. When Blue Sky Software developed the game, the film’s main protagonist, Dr. Grant, was originally the sole playable character. However, with only six levels, the game felt short and could be completed in less than an hour. 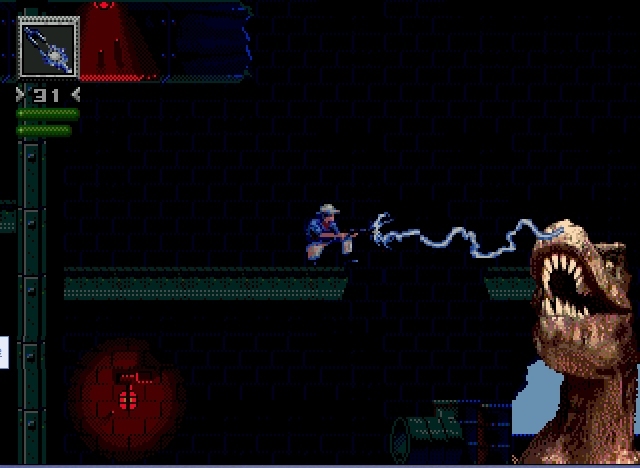 As the Raptor is a common enemy throughout the game over twenty animations were created for it. In fact enough had been created to allow for the beast to be manipulated in a similar way to the main playable human character. The sprite may have been wider and less manoeuvrable than a traditional human avatar, but tweaks to level designs accommodated for this. Consequently with minimal effort, for the first time in a film licensed game, you got to be the hero or villain. 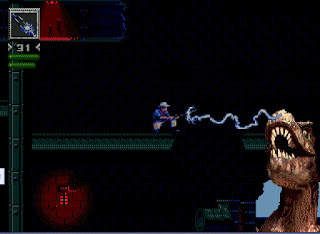 The player had a choice between leaping, slashing, munching and stalking or wielding a rifle and trying to survive against the odds. “The magic of playing through a ‘Jurassic Park’ game as one of the inhabitants wasn’t exactly as momentous as seeing those so-perfect-they-must-be-real dinosaurs out of Spielberg’s film, but it gets close” wrote media commentator Daniel Kurland. “It gets you looking at something tired like an action-platformer in a completely new way”. But as Kurland implies, ignore the novelty of playing as a dinosaur and Sega’s ’Jurassic Park’ is a very generic game. Throughout the nineties, the side scrolling action platformer was the goto genre for licensed games. While Super Nintendo players were offered a ‘Jurassic Park’ game that was an intriguing mix of first person shooting and over head exploration, Sega players got to experience a type of game they had seen countless times before. For the main campaign you play as Sam Neil’s character in the film. In a plot inspired by both the film and the book that preceded it, Dr Grant travels through seven areas of an island over run with dinosaurs. To escape he must make it safely to the Visitors Centre where a helicopter awaits. Thankfully despite playing as a mild mannered palaeontologist, Dr Grant is surprisingly adept at using an arsenal of weapons. A tranquilliser gun, cattle prod, grenades and a rocket launcher pose no technical obstacle to him. However, all of these require ammunition refills which are scattered throughout the stages, typically in hard to reach places swarming with prehistoric monsters. Echoing the likes of ‘Flashback’ and ‘Alien3’, level Exploration is defined by considering risk and reward. The route through a level is usually obvious, but taking a dangerous detour will likely mean you get a first-aid kit or a more impressive weapon. For the most part you’ll find yourself leaping between platforms, climbing up and Down ladders, sliding down inclines or traversing hanging wires. One level does see you riding a boat down mini waterfalls, but even then you’ll disembark frequently to return to leaping and climbing. The stages themselves are intricate, with tubes to crawl through and occasionally branching paths offering multiple routes to an exit. On one more involved level you also have to turn off valves to create access to certain areas. 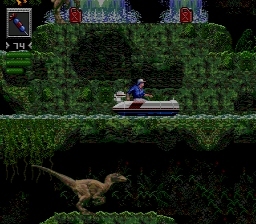 However ‘Jurassic Park’ is certainly not a ‘Metroid-vania’ type of game, as when a valve is turned the nearest water obstruction is turned off so there’s no backtracking. There are also no boss battles. Occasionally a Tyrannosaurus Rex will burst through the background, which is visually impressive but otherwise unremarkable. Provided you can avoid his head as he flails around you’ll suffer no damage. The final stage is actually based on the original planned ending for the ‘Jurassic park’ film. You trap the velociraptors that have been chasing you under the skeletons of a display dinosaur. Sadly it sounds more exciting than it is, as in practice this just means scaling the bony exhibit and shooting it till it collapses. 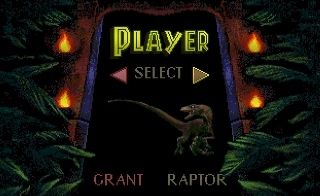 Much like John Hammond, the fictional founder of the park in the film, Sega “spared by expense” when it came to the game’s visuals. ‘Jurassic Park’ was the first Sega game to be developed using Silicon Graphics workstations, which according to The Courier-Journal, were the same state-of-the-art computers used to create the celebrated effects in the source film. 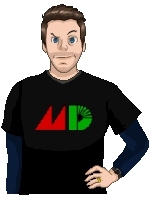 Inspired by ‘Mortal Kombat’, the spirits for Dr. Grant were created by team member Mark Dobratz acting out specific actions. These was videotaped in front of a blue screen background, with specific moments digitized and turned into the frames of the character animations. Then numerous Graphic artists tidied up the captured images while adjusting the colours. Special smoothing and blending techniques were also used to ensure consistency between the colours and the increments of movement. The result was 50 realistic animation sequences that would seamlessly blend together depending on the player’s controller inputs. 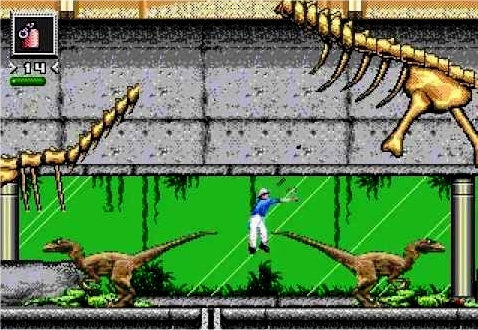 Of course when it came to the level enemies, Blue Sky games didn’t have a living dinosaur available to film. They did however have the next best thing; models used in the creation of the film, and according to CVG magazine one Velociraptor puppet from the film was said to be worth $75,000. Stop motion animation techniques created the realistic motions, and the large team of graphics artists tided the digitised images in the same way as they have done with the motion capture footage. In previews much was made of the “Artificial Dinosaur Intelligence". According to Sega Visions this causes the dinosaur enemies to react differently every time a level is played reportedly giving the player a unique experience each time. In practice I didn’t find much variation though and if anything levels felt quite baron and devoid of life at times. But the environments are certainly varied and interesting to look at. From jungles to volcanoes and even inside buildings like a power station and the visitor centre. There’s very little repetition in the environments which makes them far easier to navigate with less danger of getting lost. Evidently Levels consist of 1,120 different 8×8 pixels tiles, which could be rotated and mirrored to add even greater variation. Multi-plain parallax scrolling adds greater depth to the locations and there is grandiosity about the whole game, it’s hard to ignore the ambition behind it. Of course time is never kind and the pioneering graphics haven’t aged well. Given the limitations of the 16meg cart, there was never going to be enough space to include anything but the essentials. “Due to memory storage and delivery of sprites [...] we had to spend our time on the big moves of a character with little room for more frames” confirms TenNapel. Realistic graphics are always tormented by “The Un-canny Valley”, and it’s a sad truth that we are naturally repulsed by a lifelike playable character that doesn’t behave in a lifelike way. Dr Grant may well have 50 unique animations, but he only has one leap cycle. Considering this is what you’ll spend the majority of your time doing, the repeated identical jumps make him look robotic. The complexity of the graphic capturing process has also limited the number of different types of enemies you face. You’ll meet identical dinosaurs throughout the game and familiarity breeds’ contempt. At the time of course critics were stunned at the visuals. Pat Ferguson, a New York City-based video game industry analyst felt "The quality of the graphics is as good as it's going to get”. “The realism of Sega's "Jurassic Park" will likely keep the game on bestseller lists after the current popularity of the movie fades” adds Playthings magazine editor Frank Reysen. Sadly the budget didn’t extend to securing the rights to John William’s iconic ‘Jurassic Park’ score. Sam Powell has created alternative tracks, but they’re functional rather than memorable. Certainly no match for the Super Nintendo’s ‘Jurassic Park’ which has a soundtrack far greater than it deserved! The music of the mega drive is melodic and rhythmic but grated and irritates. Some tracks are punctuated by occasional dinosaur and bird calls. While this may have helped a feeling of immersion in the jungle environments I found it confusing; it made me think there was a foe on screen I couldn’t see. Development of the game was swift, partly because Sega knew that for it to return the significant financial investment it would have to be in shops to coincide with the film was in cinema. Blue Sky’s Richard Karpp recalls the mood in the studio at the time. “I remember a lot of pressure to get the game out in time for the movie’s release. [...] We knew that there was a lot riding on the game, because it would be getting a big marketing campaign, and we expected the movie to be huge, so we looked at it as a great opportunity. “The game’s brevity was perhaps the result of the quick turnaround time. 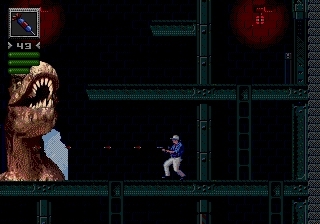 With scalable difficulty ‘Jurassic Park’ should be accessible to all, but with little incentive to replay the entirety of the game can be seen in less than 5 hours, and that includes the levels where you play as a dinosaur. There’s a case to be made that with the repetitive gameplay it’s short to not out stay its welcome; like its big screen counterpart it’s all spectacle but over before the novelty of the dinosaurs wears off. However this will come as cold comfort to someone who has spent £50 on a game rather than £7 on a cinema ticket. Impressive graphics do look great on the back of a box though, and that was at the time what many people made a purchasing decision on. While other systems had ‘Jurassic Park’ games, the Mega Drive game’s was the first to hit shelves and Sega’s big promotional drive translated into commercial success. According to The Salina Journal, Sega claimed Their First-week sales of the game broke all box office records topping $13.5 million, and selling over 2.2 million copies. Twenty years ago, Frank Reysen believed that "The added interaction, letting players be dinosaurs if that's what they want, could very well keep this game popular for a long time.” Of course with series like ‘Rampage’, ‘God of War’, ‘Grand Theft Auto’, ‘Overlord’ and ‘Infamous’ where you explicitly play as a bad guy, (not to mention other games like ‘The Last Of Us’, ‘Shadow of the Colossus’ and ‘Bioshock’ where you are revealed to be the villain) players are now used to not always being the hero. 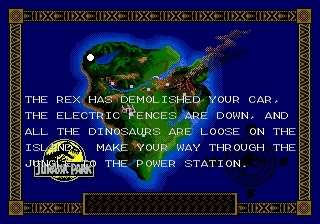 The Mega Drives’ ‘Jurassic Park’ has been cited as the first film licensed game to do this though and it was a brave, if obvious, idea. The films were sold on the dinosaurs, so of course continuing the experience at home playing as one of the fearsome beasts was always going to be popular. As Games Players magazine pointed out at the time, “In the huge sea of JP paraphernalia, this one stands out if for no other reason than it lets you rip into Dr. Grant as the raptor. 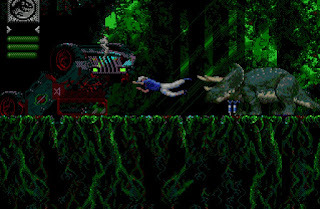 Hey - sometimes, it's enough.” The game’s ambitious graphics may have aged, it’s levels may be formulaic and it’s music may be mediocre, but as Reysen predicted even two decades later it’s still fun spending twenty minutes as a pixelated raptor devouring anything that stands in your way. It’s just a shame you never meet any slimy lawyers on toilets though! Perhaps due to our shared love of ‘Jurassic Park’ films, or maybe because I was disappointed by the SNES interpretation a friend bought this game for me for Christmas. Sadly the search will continue for a truly great ‘Jurassic Park’ game.